We hear frequently about Ottawa shoulder injuries at our clinic as the shoulder is one of the most frequently injured areas of the body. This is likely related to the amazing mobility of the shoulder joint, capable of nearly 360 degrees of motion. The joint is a very shallow ball and socket joint, depending for stability on the capsule and ligaments, a cartilage labrum (lip around the socket which deepens it for greater stability), and rotator cuff tendons and muscles. The shoulder “girdle” is made up of the collar bone, shoulder blade, lower neck and upper back and associated muscles. Each makes important contributions to movement. The younger population is at risk for dislocation injuries, as the capsule is still very pliable, and prone to tear when subjected to forces typical of throwing and high speed sports. 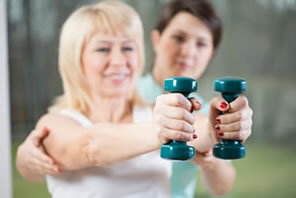 As we age, our risk of dislocation decreases, and our recovery improves, since our tissues become stiffer. Physiotherapy for shoulder injuries can provide pain relief, education and exercise instruction post injury. Tendinitis (inflammation of a tendon) occurs in the rotator cuff as a result of repetitive strain or due to impingement or “pinching” of the bursa or a tendon. This often originates in weakness of the shoulder blade muscles (trapezius and serratus anterior are important) or muscle imbalance in the region. Stiffness in the lower neck and upper back are often associated with shoulder pain. Rotator cuff tears are a common problem, usually resulting from trauma, such as a fall, a sudden pull on the arm, or lifting something, especially at arm’s length. One of the six key stabilizing muscles tears near the joint, resulting in a loss of stability of the head of the humerus in its socket. When this type of injury is suspected, investigation (ultrasound or MRI) is needed. Depending on whether the tear is full thickness or partial, physiotherapy or surgery, and possibly both will play a role in recovery. This is a common problem in “middle age”. This is an inflammation of the joint capsule, which is an envelope that surrounds the joint, and is lined with a special membrane that produces joint fluid. When inflammation of the capsule is triggered, it reacts by becoming highly irritable and “hot”. Over a period of painful months, the shoulder gradually becomes very stiff or “frozen”. There are numerous ways of treating this problem, often including cortisone injection in combination with physiotherapy (mobilization techniques and exercises) and massage therapy. Generally, this condition requires about 12 months to resolve, and usually with good outcomes.